As the name suggests, breathing though the mouth only, is not always the best way to breathe. Nasal breathing allows the air to be filtered through the nasal and various sinuses that fill the face internally and around the eyes. However, mouth breathing does have the same filtering system and causes the saliva of the mouth to dry out. It then can affect swallowing and taste. Drying out of the watery aspect of saliva, leads to a mucous and “gluey” residue on the teeth, gums, tongue, lips and rest of the mouth. The saliva hydrates the external layer of the tooth called the enamel. This allows calcium to replace the calcium lost chemically during usage. Dry mouth allows the enamel to lose calcium from the surface and then becomes soft less resistant to decay and wear. The environment in the mouth is more conducive for bacteria to thrive on the mucus-like mass on the teeth and gums. This mass is also called plaque. This plaque eventually can be become calcified and form tartar or calculus. This leads to gum irritation and eventually bone loss if it is not removed. 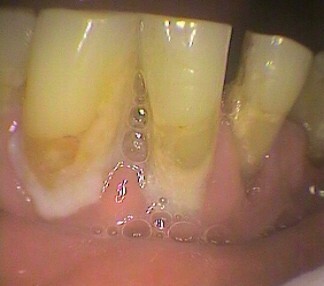 Eventually decay may occur under the plaque and tartar as well. Bad breath is more pronounced in a mouth breather as more bacteria and present and produce odour producing compounds such as sulphides (rotten egg gas). Swallowing becomes a problem as saliva is a lubricant to aid swallowing. Taste is also compromised as saliva is important in aiding the interaction with the taste buds on the tongue and through out the mouth. Importantly, saliva has antibodies that are the first line of defence in the immune system and therefore can increase the risk of disease in the mouth and further into the body. The risk of fungal infection of the mouth may increase in conjunction with a starch diet.